Apps made for an operating system shouldn't insist on aping the design elements of a totally different operating system. In so many ways, Google is the modern equivalent of Microsoft. It makes a operating system used by the majority of the market, running on an array of hardware from many vendors. 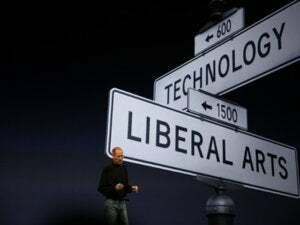 It’s powerful, ubiquitous–and the target of dislike and rage from many people who love Apple products. Now, I was never someone who bought into Microsoft hate. I never liked Windows, but I wrote hundreds of thousands of words on Microsoft Word for Mac. The first magazine cover story I ever wrote, for MacUser, was a web browser shootout between the incumbent, Netscape, and a scrappy upstart called Internet Explorer. I wrote that IE was the better browser, which was quite a controversial statement in the days when “Windows 95 = Macintosh ’89” buttons were in wide circulation. So let’s recap what Microsoft did in the ’90s. While Microsoft was busy building its Windows empire, from the very beginning it had been a good citizen on the Mac. Word and Excel had been with the Mac since the beginning. Excel was born on the Mac. I would wager that Word and Excel were the two most popular third-party programs on the Mac back in those days. Then came 1993, and something funny happened: Microsoft released new versions of Microsoft Office for the Mac, all based on the Windows code base. The familiar Mac versions of Microsoft’s apps vanished, replaced by programs that didn’t behave like Mac apps at all. They were very clearly members of the Office for Windows suite, ported over to the Mac. Why did Microsoft do it? To this day I can’t decide if they were so high on the greatness of Windows that they imagined Mac users would take to the new Office like a glass of ice water in hell, or if they just cared so little for the Mac that it was no longer worth creating apps specifically for the Mac. In any event, users rebelled, sticking with old versions of Word and Excel for years, or finding alternatives. At some point in the mid–90s I used WriteNow, Nisus Writer, and WordPerfect in a search for a better Mac word processor than Word 6. When Office 98 appeared several years later, it did so with a heap of apologetic language from Microsoft and a greater embrace of Mac interface conventions. As someone in Google’s ecosystem as well as Apple’s, I’m happy that they continue to develop apps for iOS. Unfortunately, every time I open one of them, I’m brought back to the mid-’90s and Word 6. Google Docs on iOS. Or is it Android? No, no, that’s iOS. I don’t know the reason–arrogance, pride, or a lack of desire to do the extra work are all options–but for a while now, Google has insisted on using the Material Design approach when creating iOS apps. Just as Word 6 inflicted Windows conventions on Mac users, Google’s iOS apps inflict Android on iOS users. 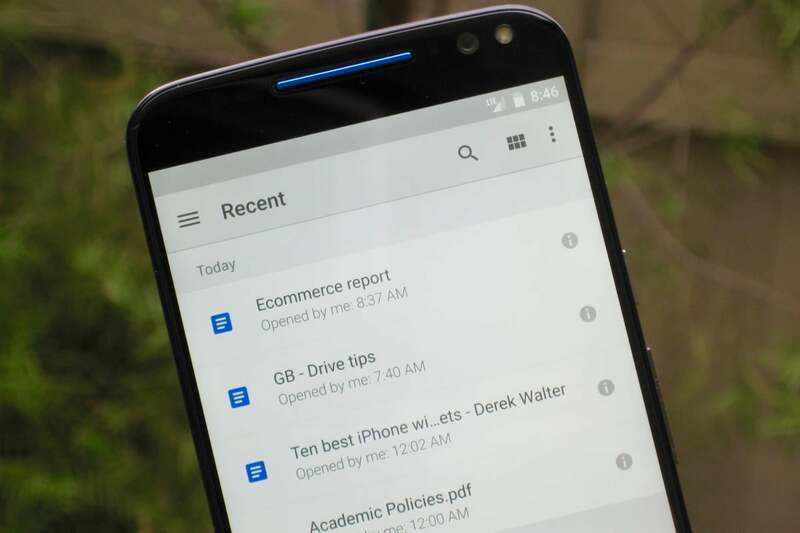 Open Google Docs for iOS and you’re whisked into a Material Design world. 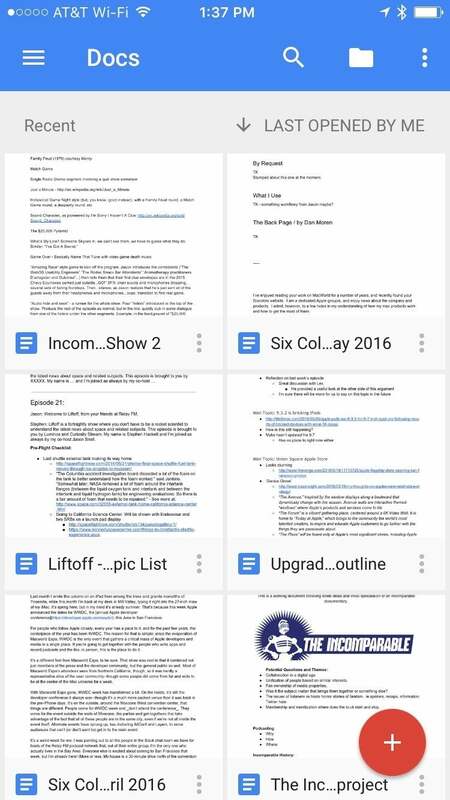 To create a new document, you must tap a large red circle at the bottom right corner of the screen. The options icon is three vertical dots, rather than the three horizontal dots favored by Apple. Menus display in Material Design style, white cards on a gray background. Users choose platforms for various reasons, but once they’ve chosen a platform, they deserve consistency. Good Mac apps should feel like Mac apps, and good Windows apps should do likewise. If iTunes for Windows feels like a Mac app, Apple’s doing it wrong. (One could argue Apple’s doing it wrong with iTunes everywhere, of course…) If Apple Music for Android feels like an iOS app, that’s a mistake. 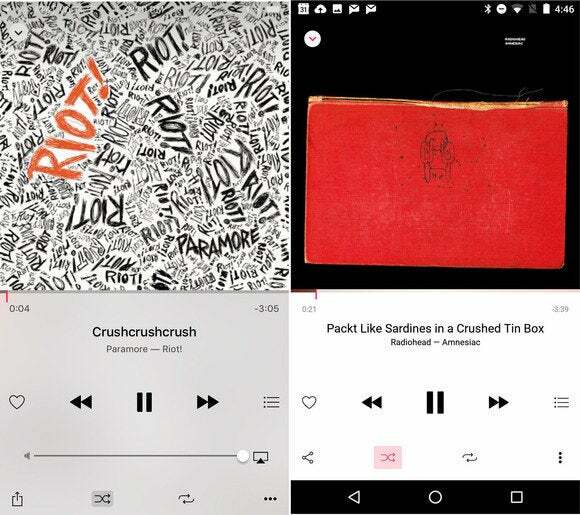 Apple Music for iOS (left) and Android (right). Notice the different Share button and More button. A common response to this complaint is that Google is after “consistency.” Material Design allows Google to offer the same interface everywhere, across the Web, Android, and iOS. You know who else defended their choices with that old saw? Yep: Microsoft. It was more important to Microsoft for people to get the same experience with Office when moving from Windows to Mac than it was for Mac users to move to Word from some other Mac app. It was a bad rationale then, and it’s still bad today. 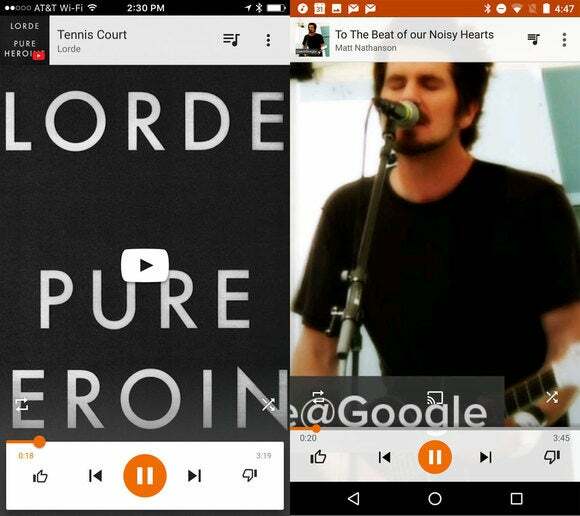 Google Play Music for iOS (left) and Android (right). Looks like the same Android app both places. App developers should always have room to innovate. Developer Loren Brichter invented the “pull to refresh” gesture in his app Tweetie, for example. But what Google’s doing with its iOS apps isn’t innovation, it’s just importing the design of Android into iOS. It’s great that Google’s apps are available on iOS. I just wish their designers would focus more on being good iOS citizens. There are some encouraging signs on this front: In just the past few months, I have noticed a disappearance of the Android share icon (a blob growing into two blobs) and the reappearance of the iOS share icon (an arrow leaving a box) throughout Google’s iOS apps. Perhaps Duarte changed his mind? Or Google’s designers have gotten more of a say? Either way, I hope the trend continues. Mac users spent the mid-’90s seeking out alternatives to Microsoft’s apps. I’d hate to have to do the same in the mid–2010s to Google’s iOS apps.